They smell freaking terrible:(. I decided tonight that the Mexican Pizzas didn’t sound all that good and Joey observed that we were a little low on cheese anyway, so I decided that I just wanted some oven-roasted sweet potato chunks. Joey agreed to make them while I was finishing up a reading assignment and I told him to roast them on about 475*. I didn’t realize that he was going to dice them so small, so when I finished my book, I asked him if he thought they were ready, and they were tiny, black, charred nuggets:(. There were a few salvageable ones, but I put them in the fridge and the narsty burnt-sweet potato smell turned me off on that dinner choice. So…eh….I sent Joey to Taco Bell for a salad for me (Fiesta salad, no meat, guac added). It came out to $7. This brings us to $30 in takeout total in January. I was disappointed in myself for wanting takeout, but when I looked at the total, we’re really right on schedule! 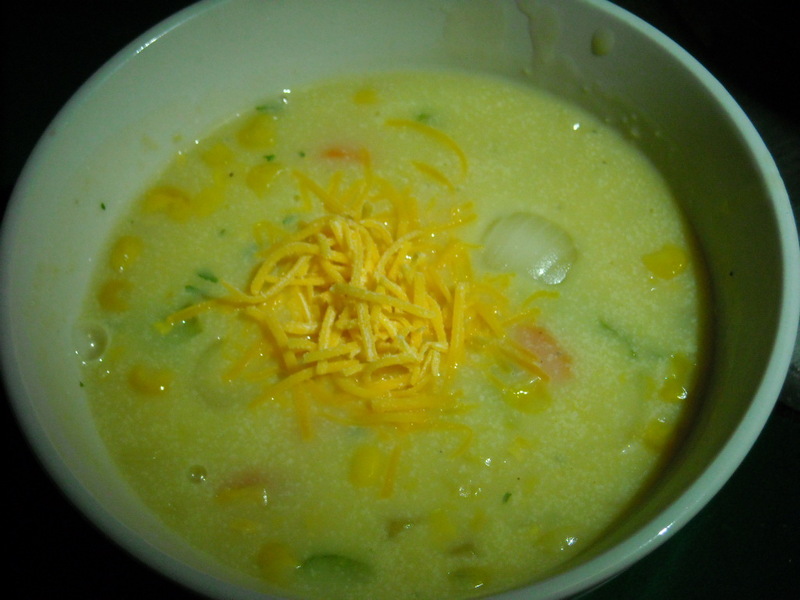 Monday night’s Corn Chowder was INCREDIBLE!! Here’s the recipe. I didn’t adjust too much; I did use cornstarch instead of flour as the thickening agent. Unless you’re making a roux, I don’t know that just chucking flour into a pot of soup is a good idea, and I didn’t want to use butter and whatnot. The cornstarch worked just fine! Tuesday night was spicy baked potatoes (again) which Joey made, and last night, we hit the leftovers. We also made it to the gym on Monday and Tuesday (we planned to go tonight, but it was monsooning outside and we just decided to stay in). School is kicking my tail a little. I read a novel on Tuesday and another one Wednesday. We also had a half-day of corporate training today, about excellent customer service. Good info, but a long time away from my desk, which left me in a panic the rest of the day trying to get caught up. Knitting news: I’m working on a bell-sleeved shrug. I haven’t had time to knit on it since last weekend. I want to be able to knit some more on it soon. I’d like to be able to wear something that I make.